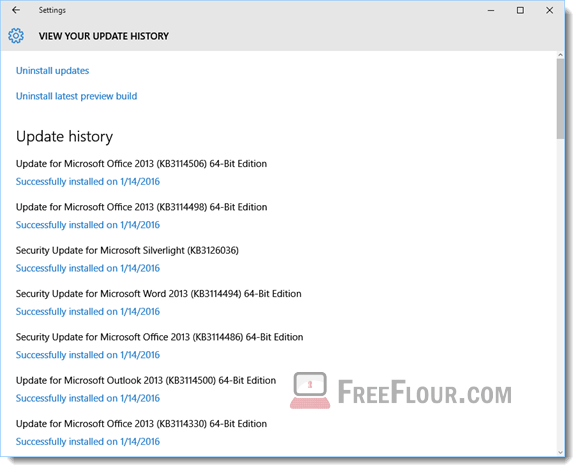 How to check Windows Update History in Windows 10 and uninstall any update. How to clear updates log when update history is Blank or Missing. Checking Windows Update history log will give you a rough idea of what has been installed during Windows Update session and when they were installed. If you face a problem you can’t fix shortly after a session of Windows Update, you may want to try uninstalling a specific update which you suspect to be the cause of your problem. This page will show you how to check the Windows Update history in Windows 10 so that you can remove any of them. This applies to Windows 10 users only but it should look pretty much the same in Windows 8 or Windows 7. Click on the Start/Windows button. Click on Update and Security. If you don’t see it, you may be in a setting page that you last opened. 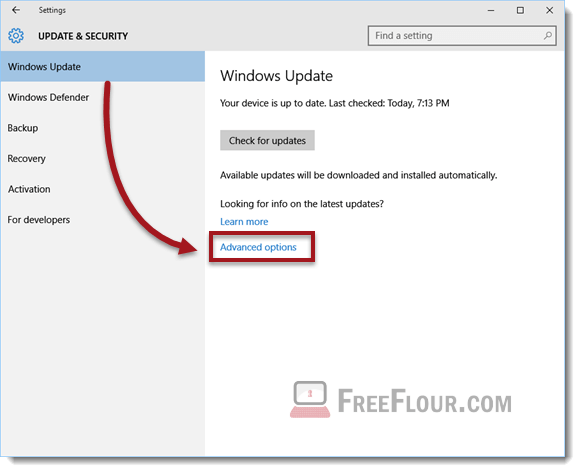 Click on the back (left) arrow on the upper left corner of the window to go back to the main page of Settings and look for Update and Security again. On the left panel, click on Windows Update. This is where all the Windows Update settings are. Click on View your update history. Here’s where you can check and see all the previously installed updates. This list will show only the updates that were successfully installed along with their installed dates. Some updates that were not selected during Windows Update or were failed to be installed will not be shown in the list. To uninstall an update, click on Uninstall Updates link on top of the page. Right click the update you want to uninstall and then select Uninstall. For your computer to remain its optimal security, you are advised not to simply remove any update if it’s not the last resort. Though, you can always re-install the updates you have deleted by re-running Windows Update and select the update from the optional list. Windows Update History blank, missing or disappeared? Sometimes the settings page in Windows 10 can be buggy. If that’s the case, in the Windows Update history page, click on the Uninstall updates. This will bring back the classic control panel window that looks about the same in Windows 7 or 8. 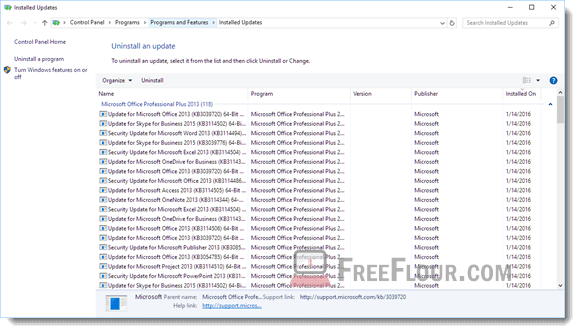 You should now in the Installed Updates window where you can view all the installed updates in a much clearer table with details such as program, publisher and installation date. Well, I don’t know why you would want to do that, but unfortunately, the update history cannot be cleared. For security purposes, Windows 10 doesn’t allow user to clear the list of installed updates history. Thus, there is no way to hide or remove the history of installed updates. Tips: If you have multiple computers running Windows 10 in the same local network, you can download and share the updates among the computers to save time and your internet bandwidth. 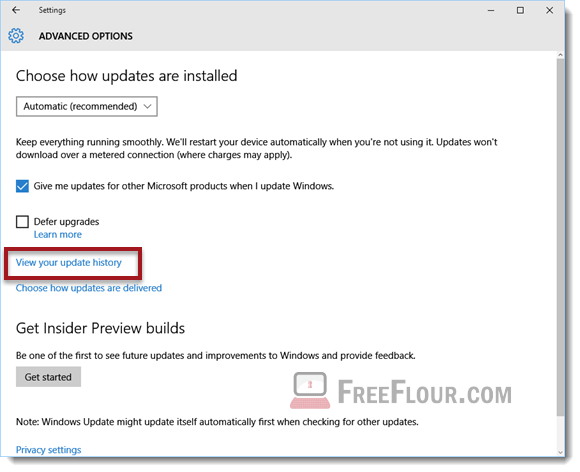 To enable this feature, go to the Windows Update setting page, Advanced Options, and then Choose how updates are delivered. Turn it on and select PCs on my local network.